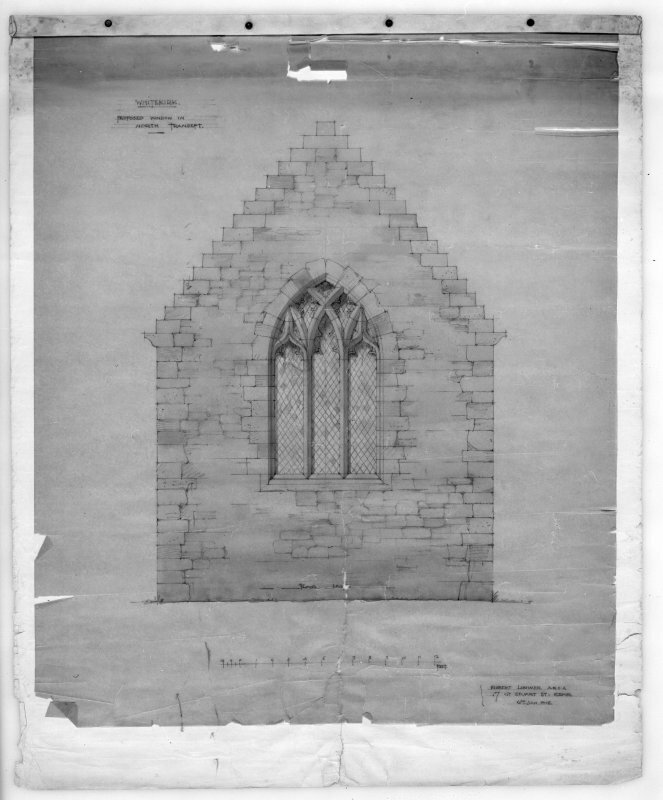 Photographic copy of drawing of proposed window in North transept. 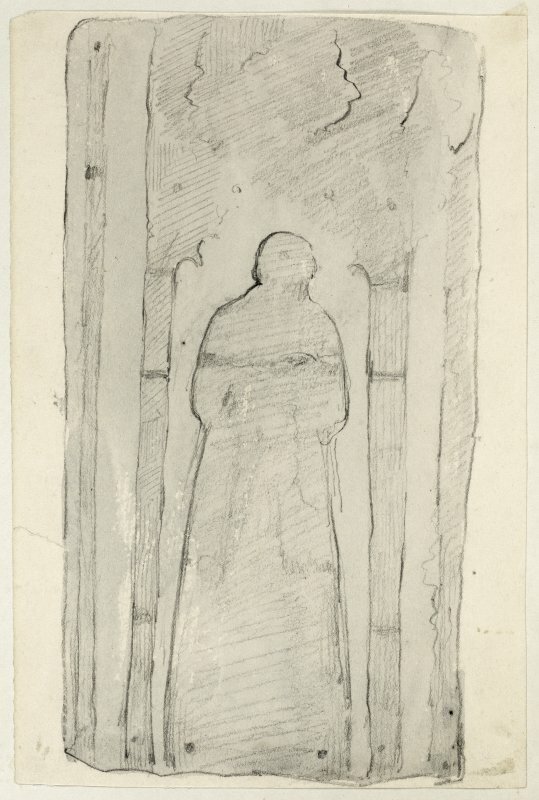 Insc: 'Whitekirk, Proposed Window in North Transept', 'Robert Lorimer A.R.S.A, 17 Gt. Stuart St., Edinr, Oct. 1914'. 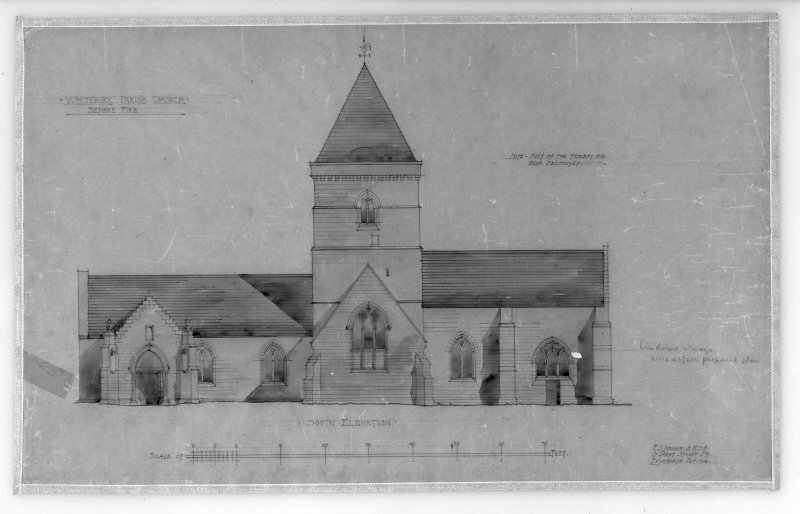 Photographic copy of drawing of proposed restoration to North elevation. 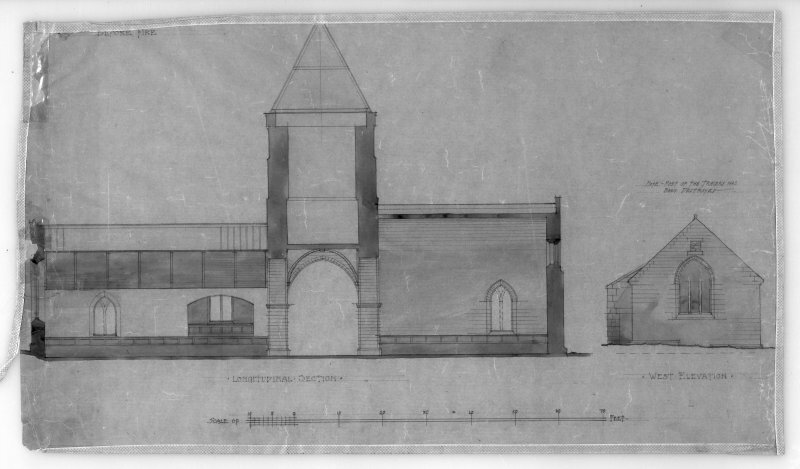 Insc: 'Whitekirk Parish Church, Proposed Restoration', 'North Elevation', 'Robert Lorimer A.R.S.A. 17 Gt Stuart St., Edinr, Oct. 1914'. 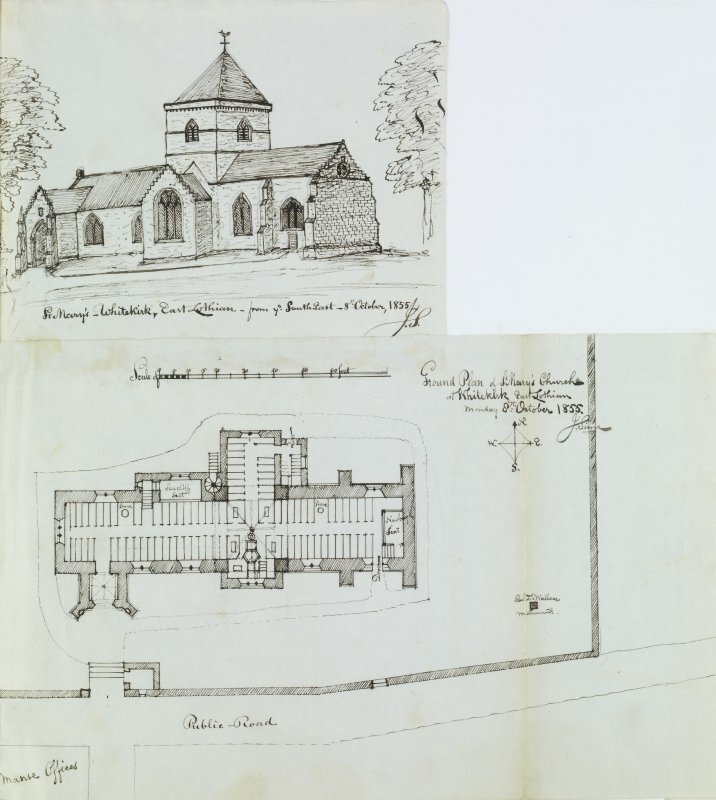 Photographic copy of drawing of proposed restoration to section and elevation. 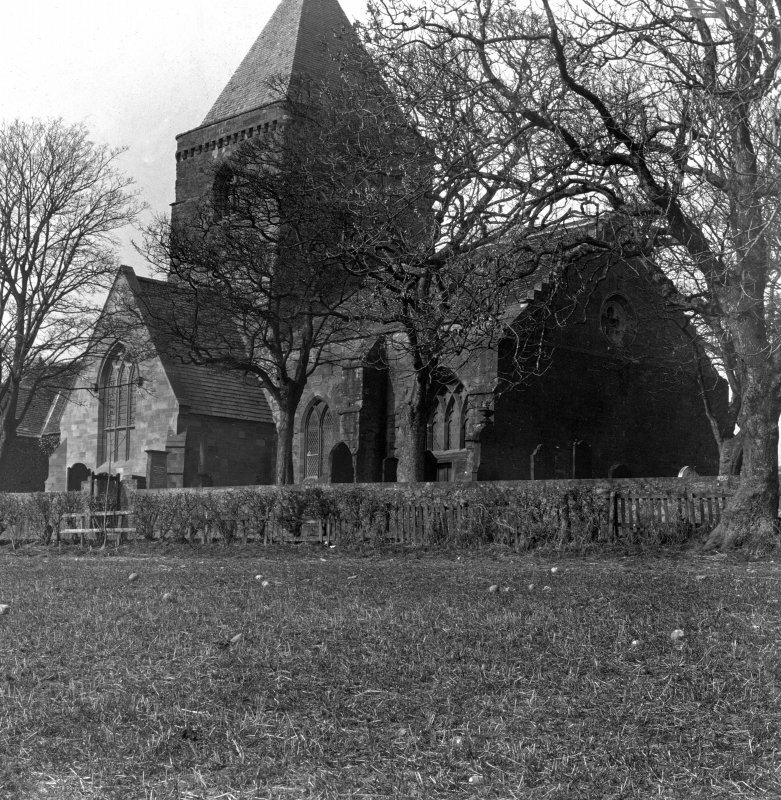 Insc: 'Whitekirk Parish Church, Proposed Restoration', 'Section', 'Robert Lorimer A.R.S.A., 17 Gt. Stuart St., Edinr, Oct. 1914'. 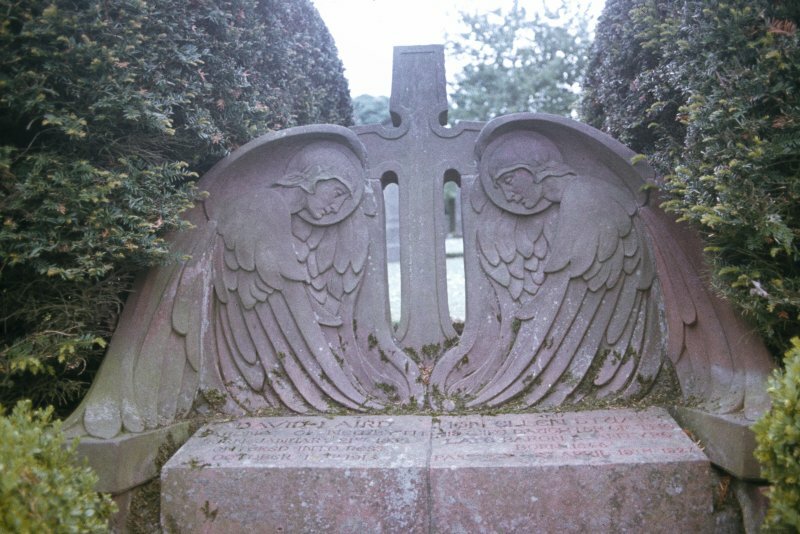 View of headstone showing winged soul, Whitekirk Parish Church Burial Ground. 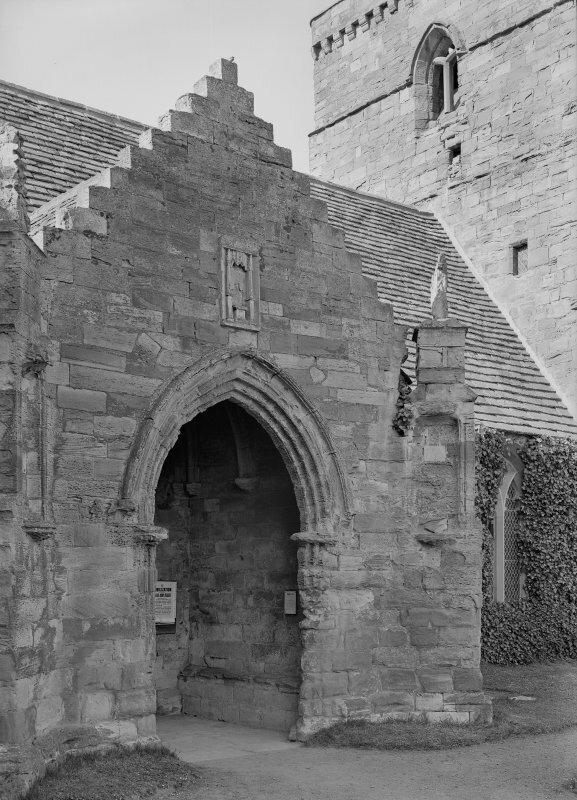 View of porch and tower from S.
Whitekirk, Parish Church. 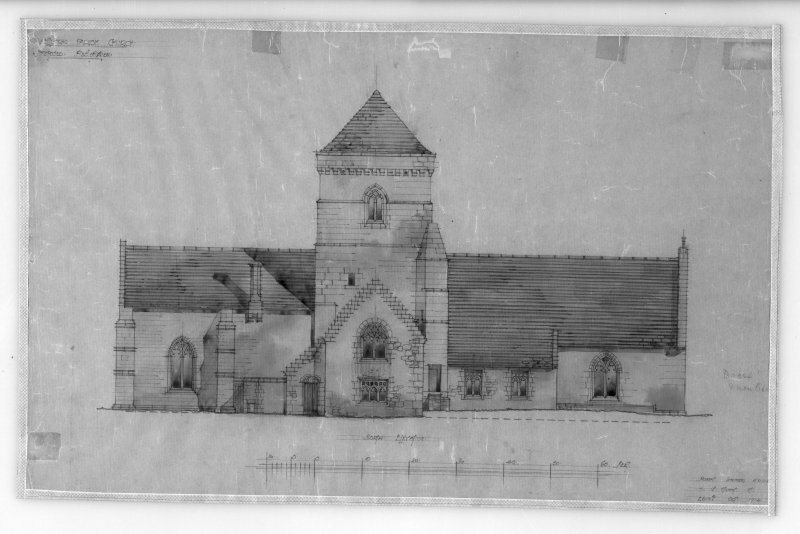 Photographic copy of drawing of proposed restorations on South elevation. 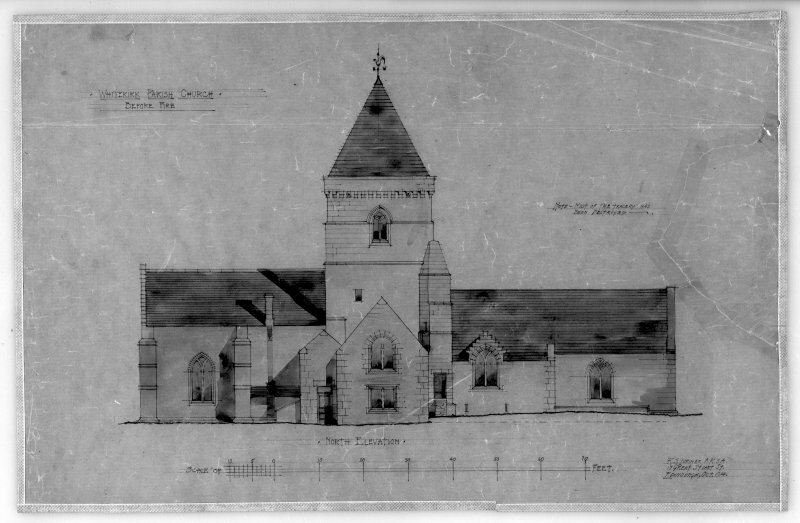 Insc: 'Whitekirk Parish Church, Proposed Restoration', 'South Elevation', Robert Lorimer A.R [S.A.], 17 Gt Stuart St., Edinr, Oct. 1914'. 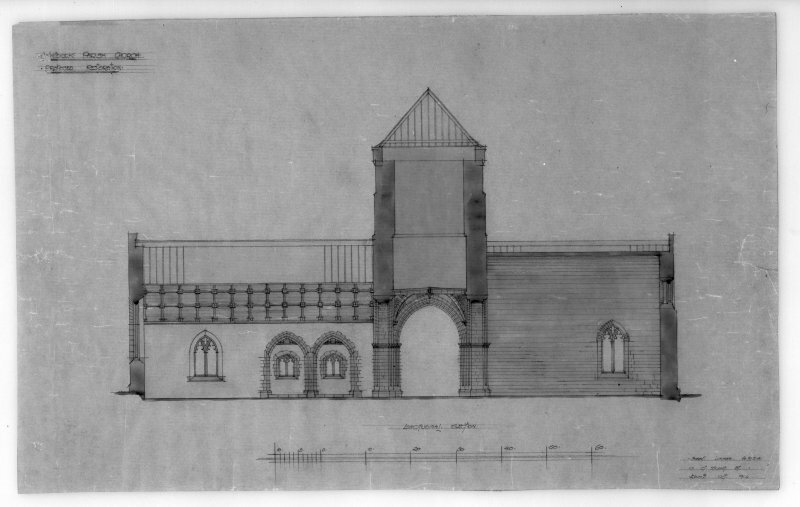 Photographic copy of drawing showing reconstruction of longitudinal section and West elevation before fire. 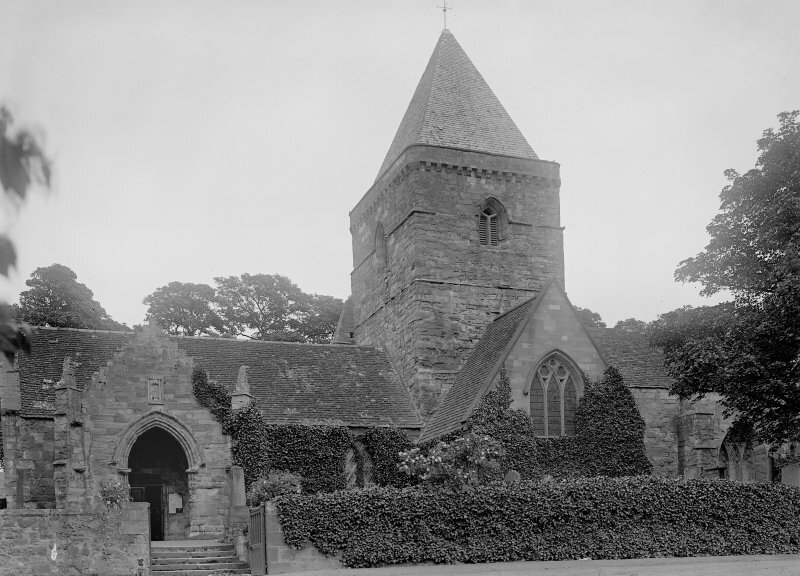 Insc: '[Whitekirk Parish Church], before fire', 'Longitudinal Section', 'West Elevation'. 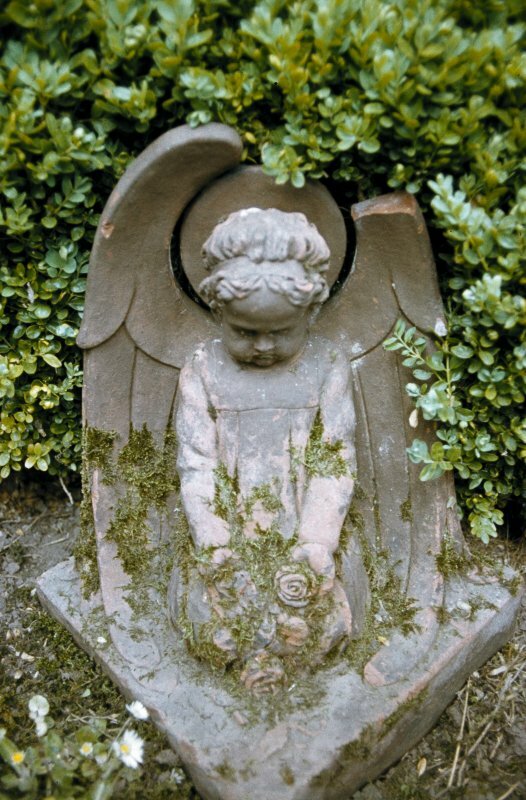 Detail of headstone to David Aird showing winged angels, Whitekirk Parish Church Burial Ground. 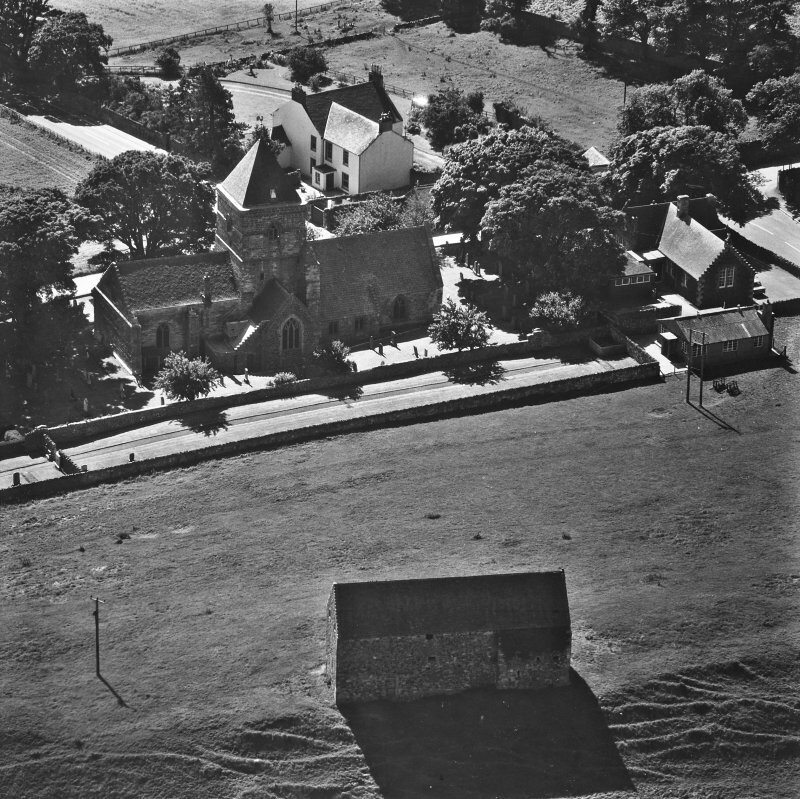 Oblique aerial view centred on the village with the parish church adjacent, taken from the ENE. 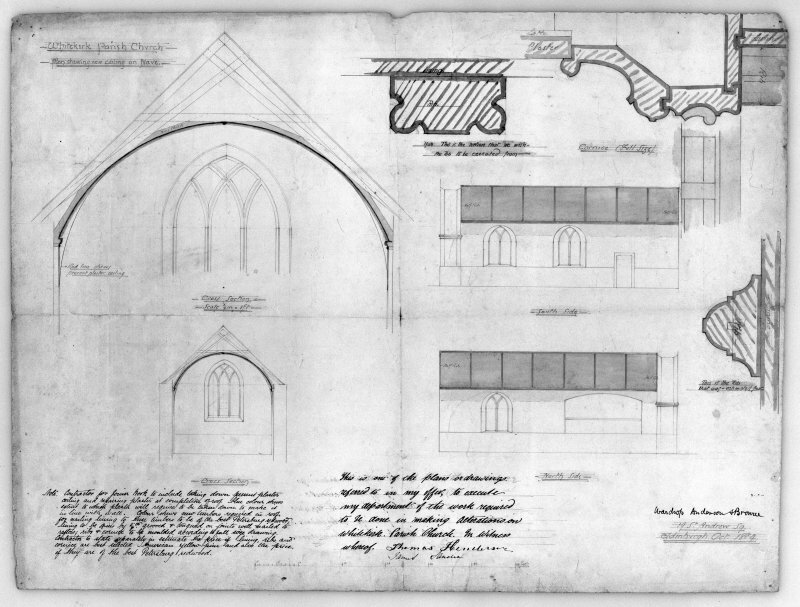 Photographic copy of drawing of proposed restoration to longitudinal section. 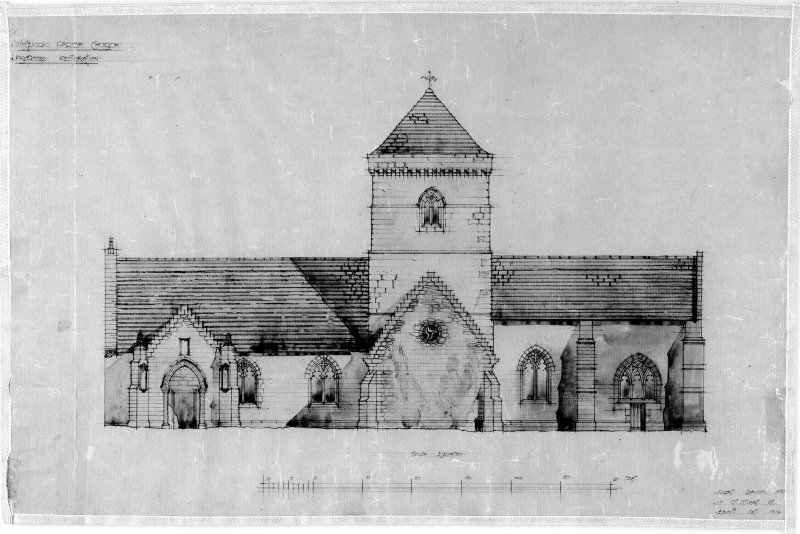 Insc: 'Whitekirk Parish Church, Proposed Restoration', 'Longitudinal Section', 'Robert Lorimer A.R.S.A., 17 Gt. Stuart St., Edinr, Oct. 1914'. Photographic copy of drawing of reconstruction of North elevation before fire. 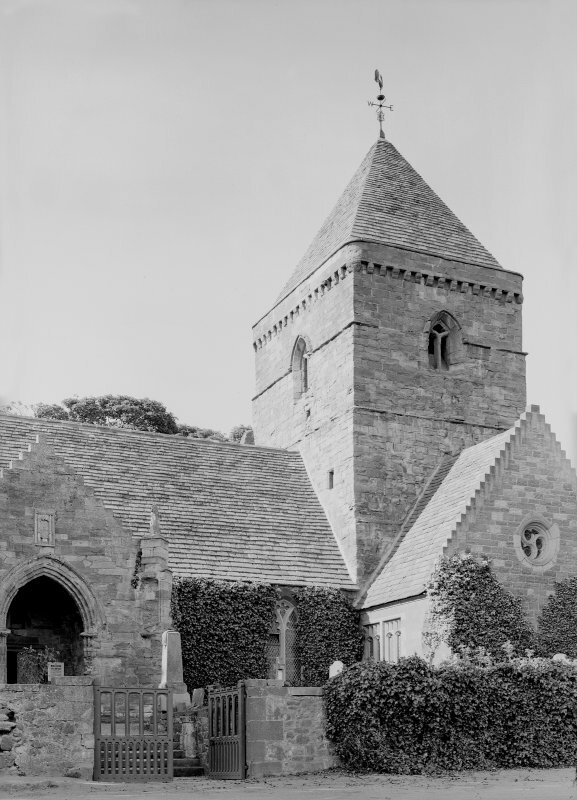 Insc: 'Whitekirk Parish Church, Before Fire', 'North Elevation', 'R.S. Lorimer A.R.S.A., 17 Gt Stuart St., Edinr, Oct. 1914'. 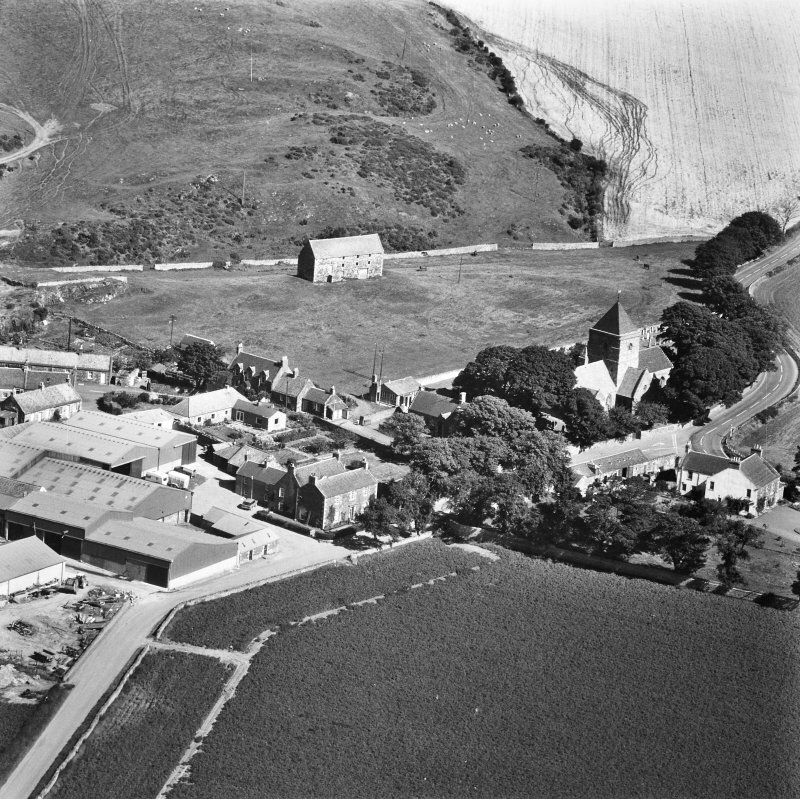 Oblique aerial view centred on the village with the parish church adjacent, taken from the ESE. 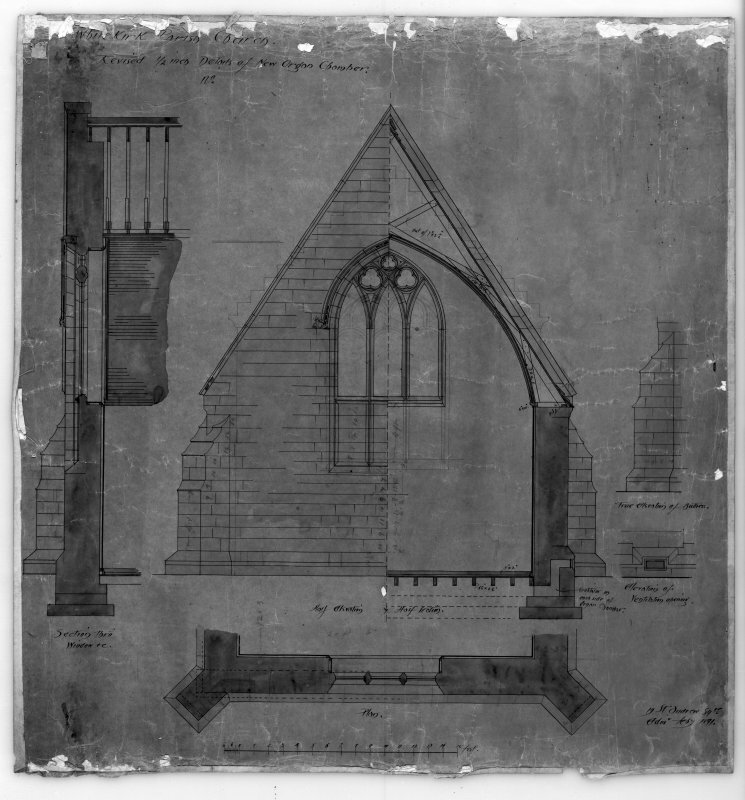 Photographic copy of drawing of reconstrucion of South elevation before fire. 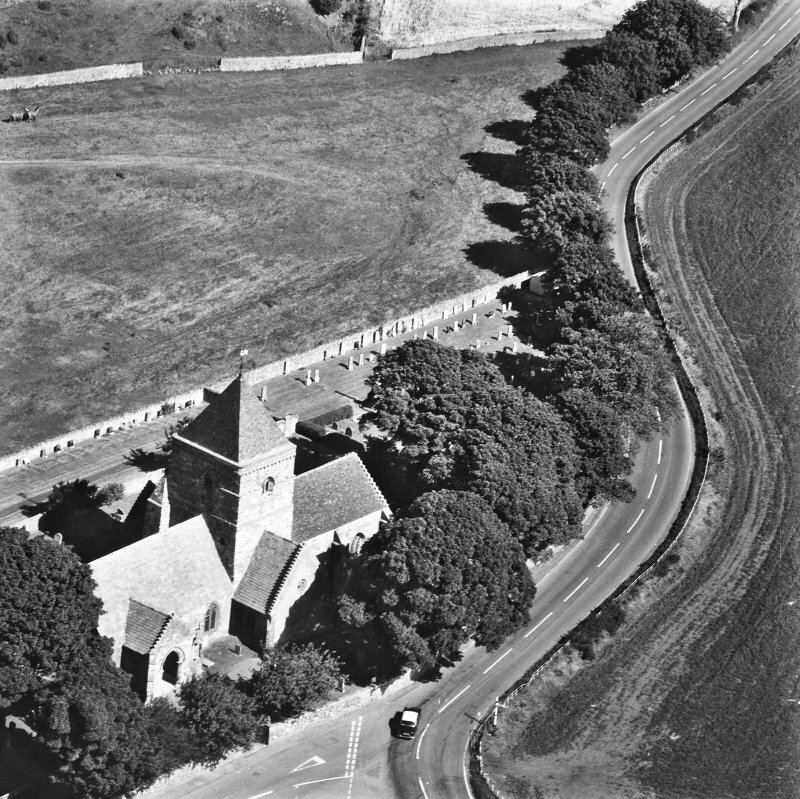 Insc: 'Whitekirk Parish Church, Before Fire', 'South Elevation', 'R.S. Lorimer A.R.S.A, 17 Gt. Stuart St., Edinr, Oct. 1914'. 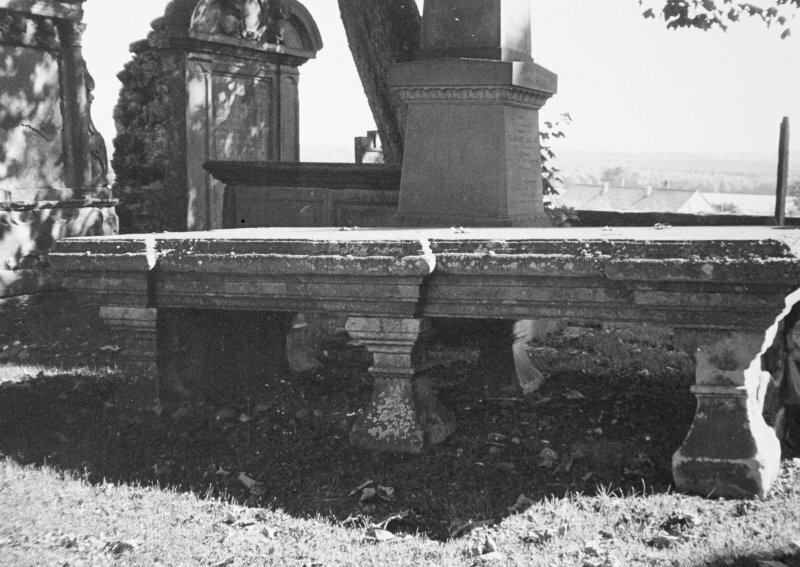 Photographic copy of plan showing seating and details of seating. 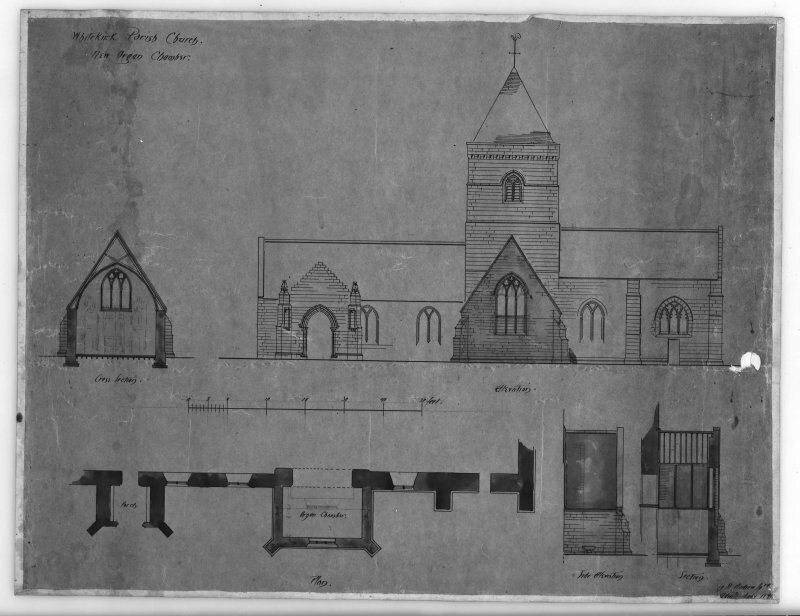 Incs: 'Whitekirk Parish Church, Half Inch Plan Showing Seating', 'Lorimer and Matthew, Architects, 13 Gt. Stuart St., Edinburgh'. 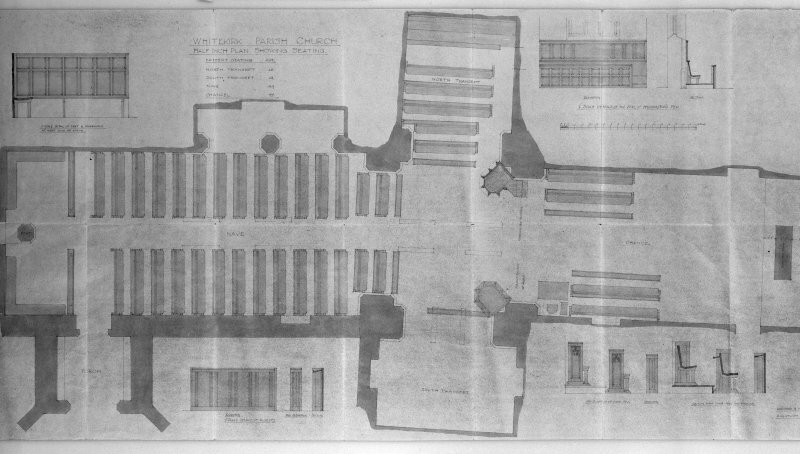 Photographic copy of drawing of sections, elevations and details of nave. Insc: 'Whitekirk Parish Church, Plan Showing New Ceiling on Nave', 'Cross Section', 'North Side', 'South Side', 'Wardrop, Anderson and Browne, 19 St. Andrew Sq., Edinburgh, Oct. 1884'. 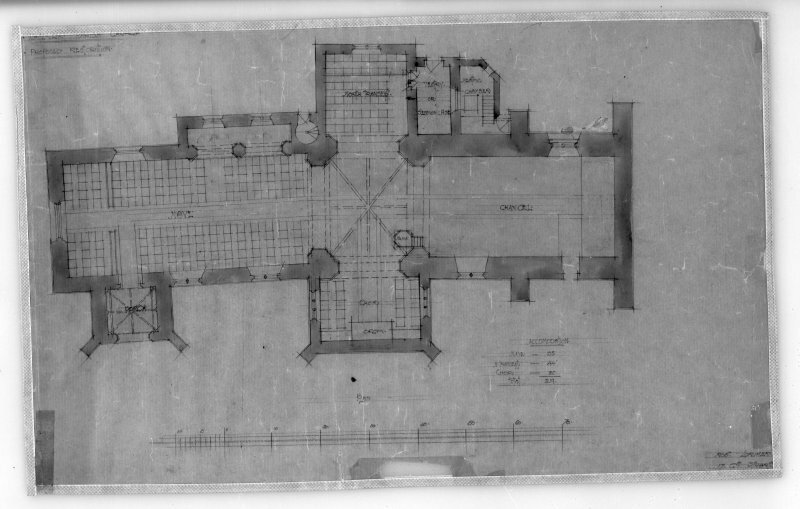 Photographic copy of plan for proposed restorations. 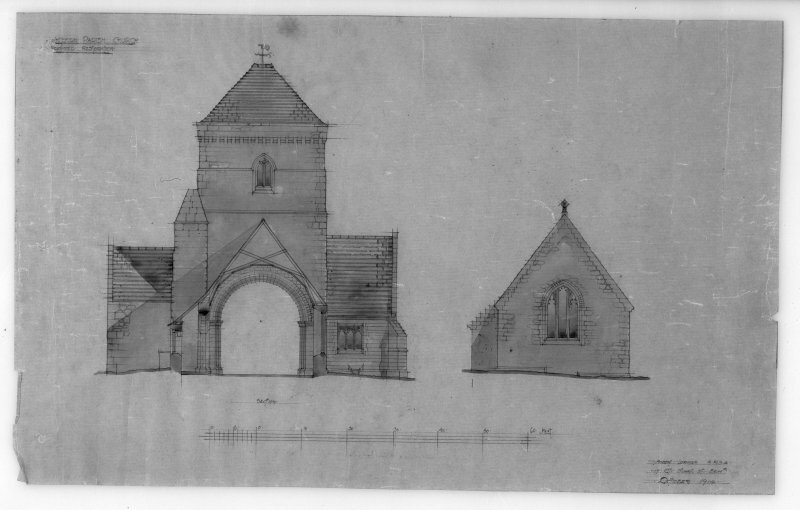 Insc: 'Whitekirk Parish Church, Proposed Restoration', 'Plan', 'Robt. Lorimer [A.R.S.A. 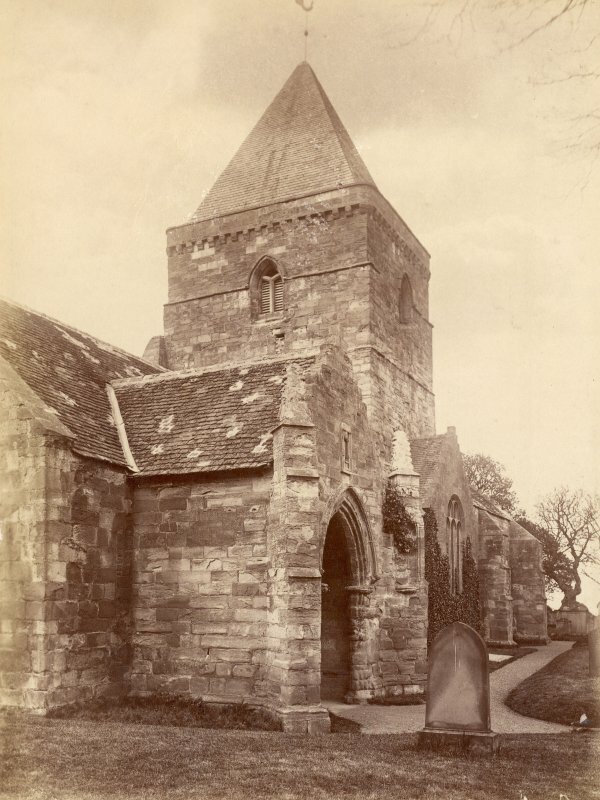 ], 17 Gt., Stuart [St., Edinr, Oct. 1914]'. 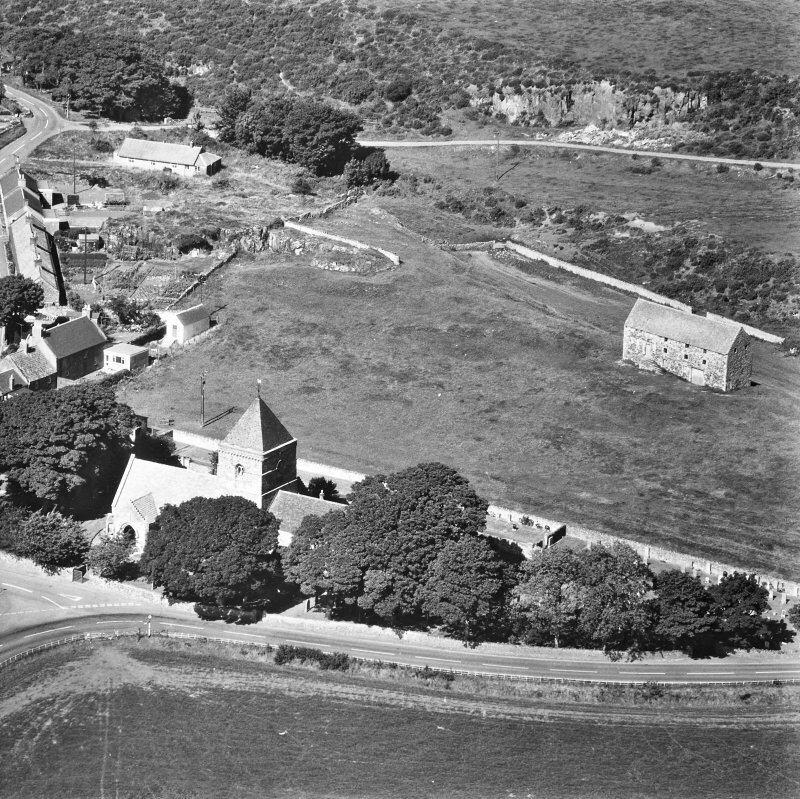 Oblique aerial view centred on the village with the parish church adjacent, taken from the N.
Oblique aerial view centred on the village with the parish church adjacent, taken from the SE. 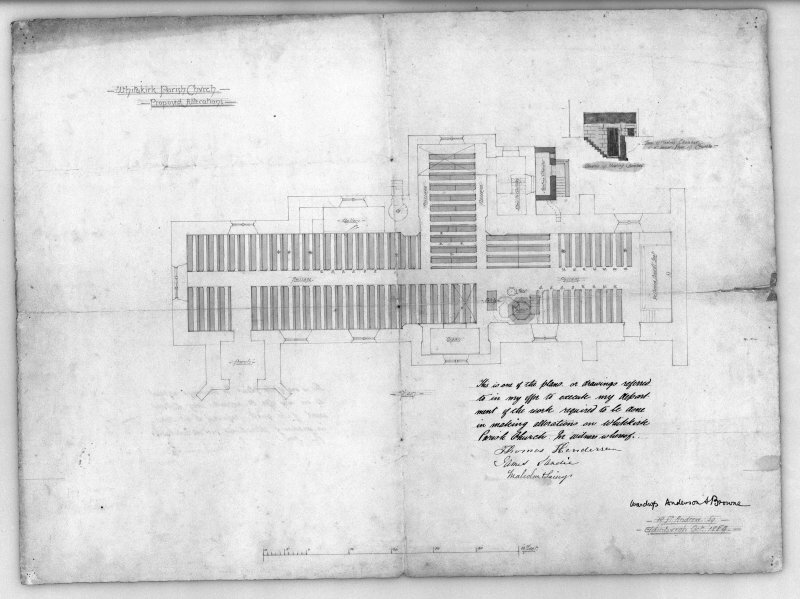 Photographic copy of drawing showing revised details of new organ chamber. 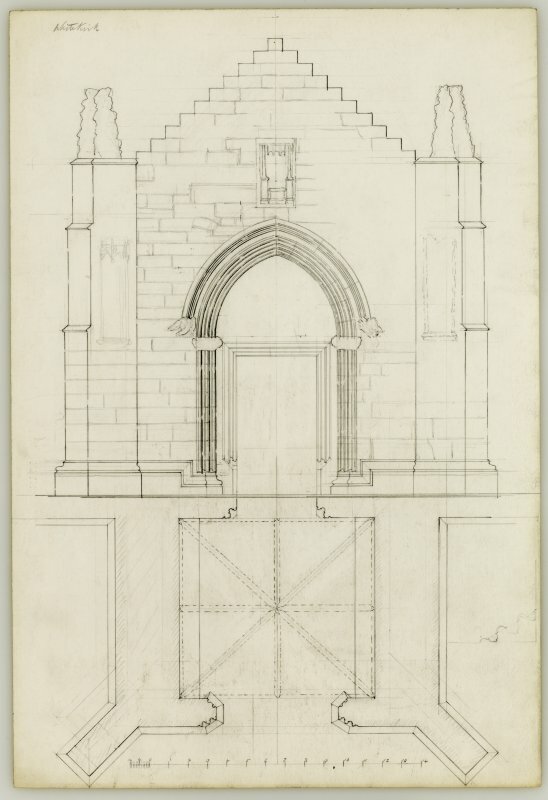 Insc: 'Whitekirk Parish Church, Revised Details of New Organ Chamber', 'Section', 'Plan', and 'Elevation', '19 St. Andrew Sqre, Edinr, Feby 1891'. 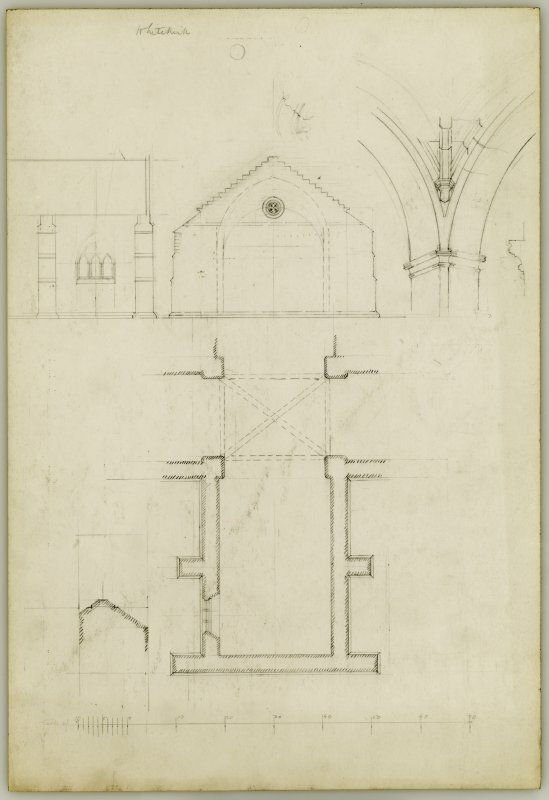 Photographic copy of elevation, plan and sections of the organ chamber. 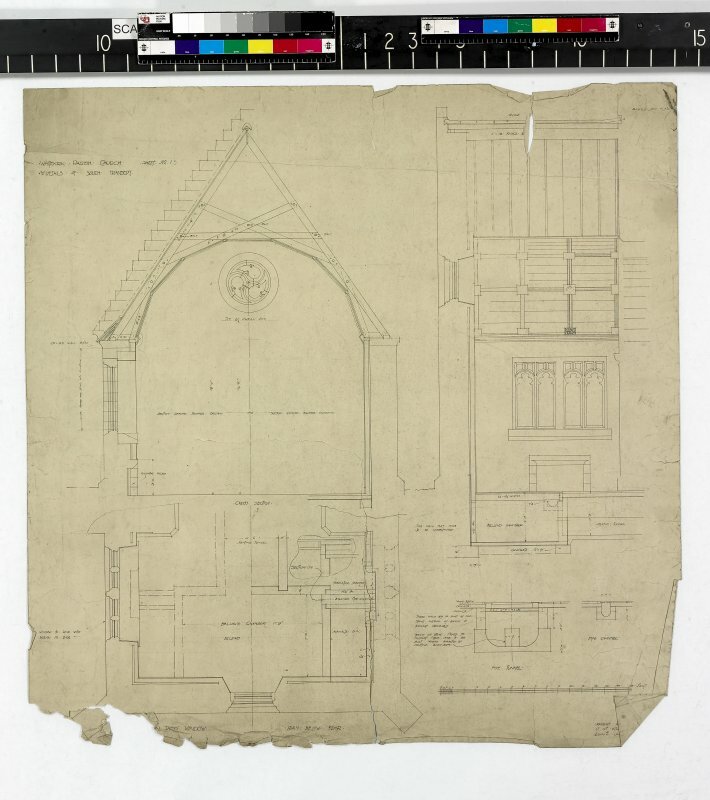 Insc: 'Whitekirk Parish Church, New Organ Chamber', 'Cross section', 'Elevation', 'Plan', '19 St Andrew Sq., Edinr, Feby 1891'. 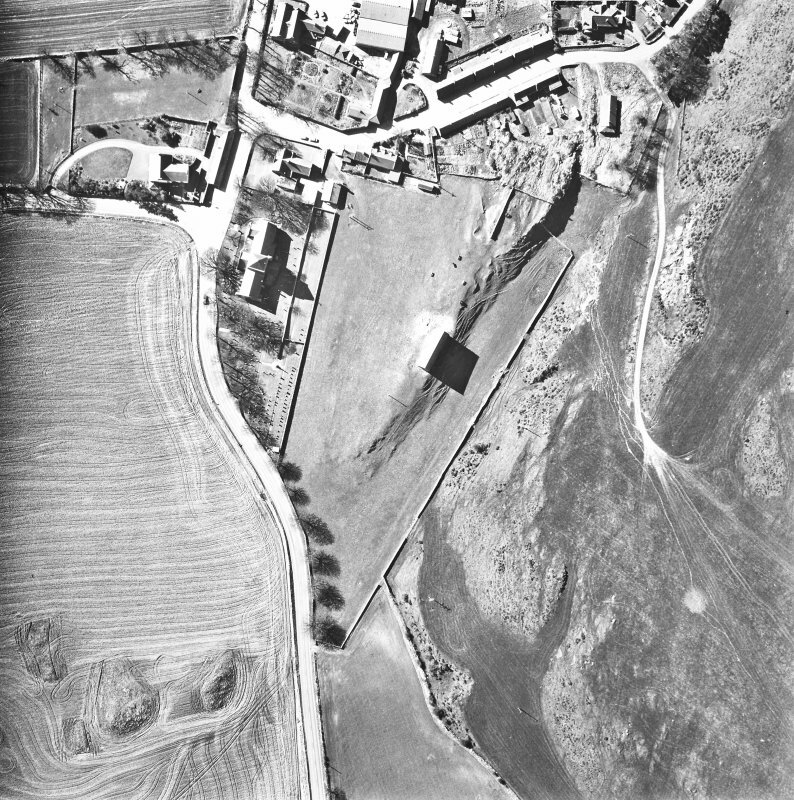 Photographic copy of plan of proposed alterations. Insc: 'Whitekirk Parish Church, Proposed Alterations', 'Plan', 'Wardrop, Anderson and Browne, 19 St. Andrew Sq., Edinburgh, Oct. 1884'. 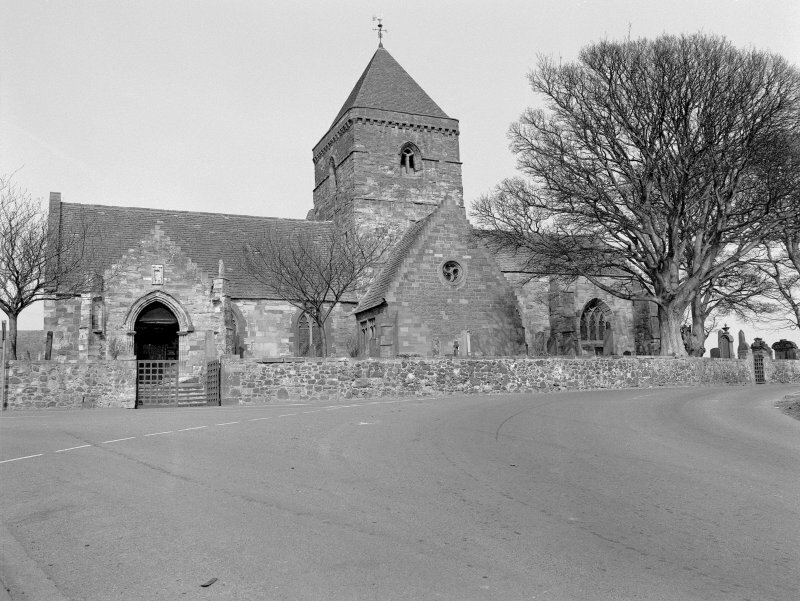 (NT 5962 8151) Whitekirk Parish Church: In the 12th century, Whitekirk was simply a parish church (dedicated to the Virgin Mary) belonging to Holyrood Abbey, but by about 1300 miracles of healing were being performed at a nearby well (NT58SE 30) and the church was placed under the protection of James I; it reverted to its position as a parish church in the 17th century and survived almost without alteration until 1914, when it was set on fire by suffragettes. 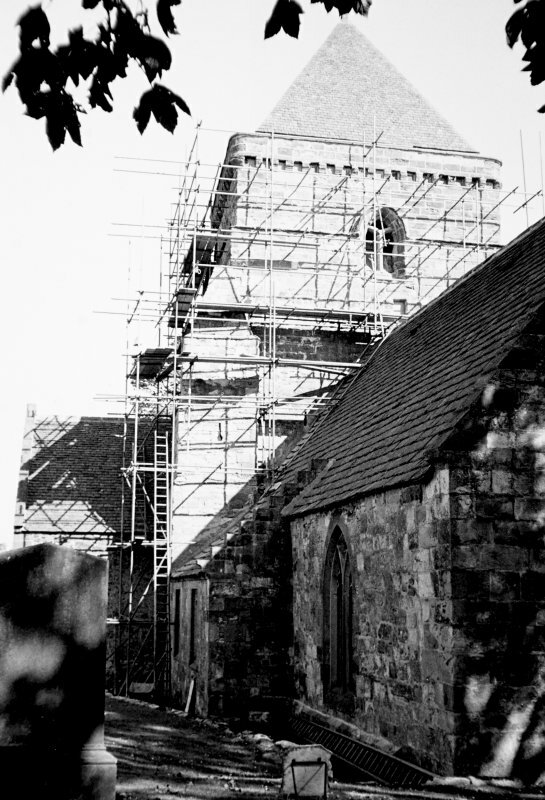 The walls sustained little damage and a careful restoration was carried out by Robert Lorimer. 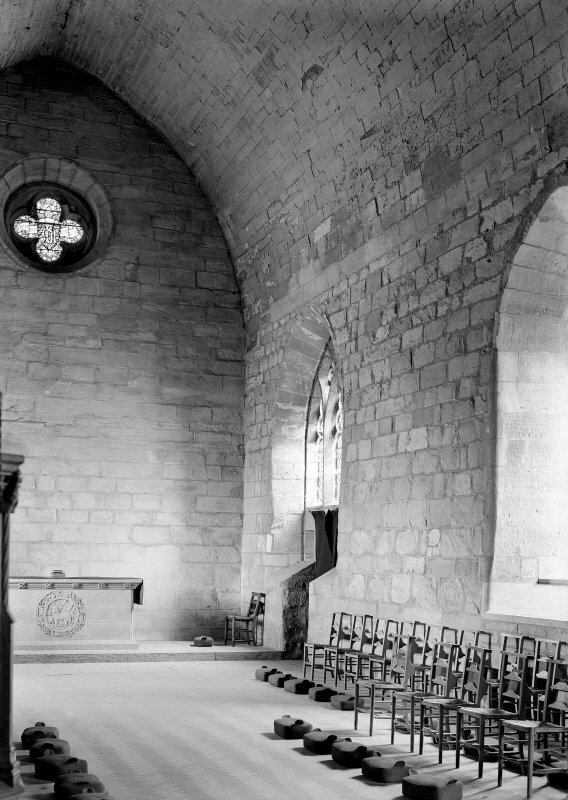 It is cruciform on plan with a squat central tower and a two-bay choir with prominent buttresses. The only medieval tracery is in the S window. 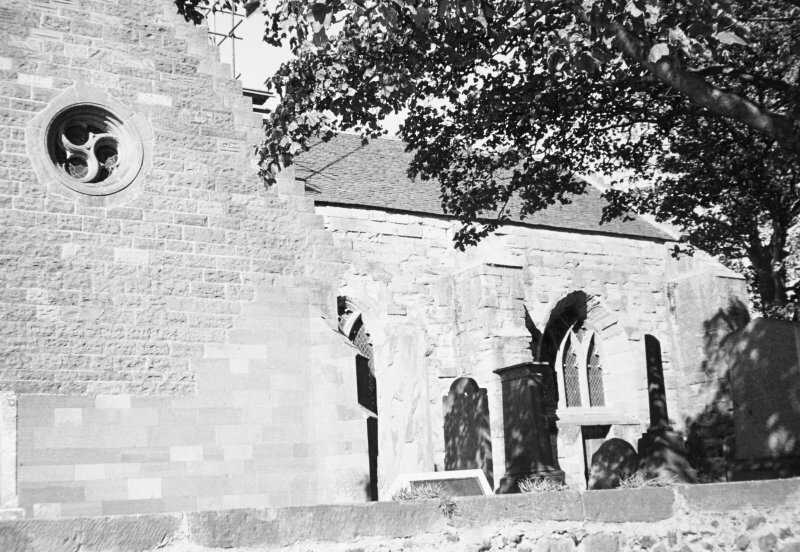 The E wall is blank except for a small oculus high up (renewed correctly after 1914) and a small armorial panel; the arms have been identified as those of Abbot Crawford of Holyrood (1460-83). This is not reconcilable in any obvious way with a record that Adam Hepburn of Hailes Castle built the choir in 1439. 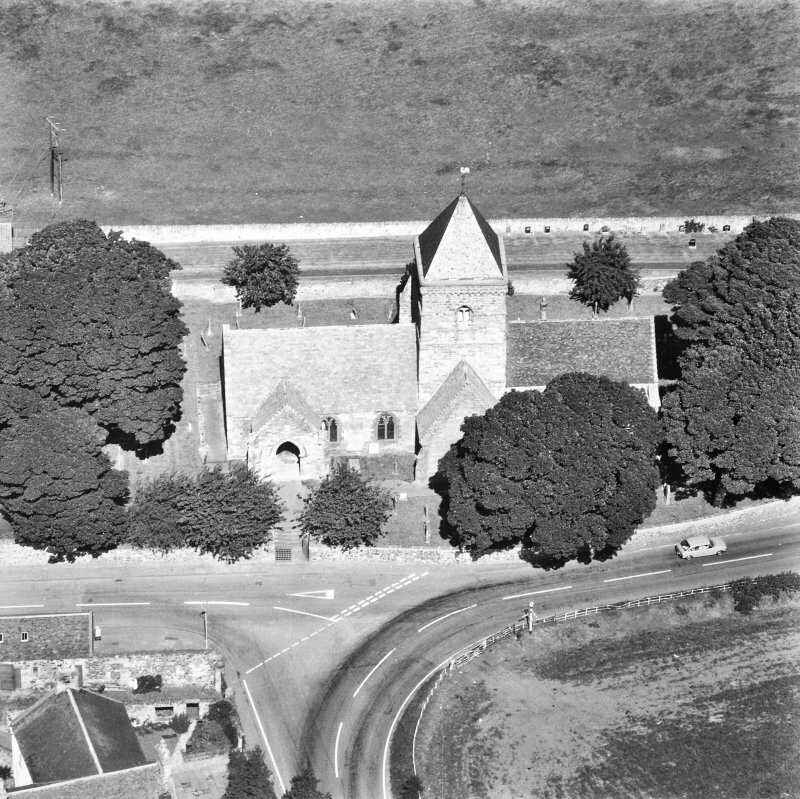 The N transept has no old features and the S transept is of 1830, much rebuilt by Lorimer. 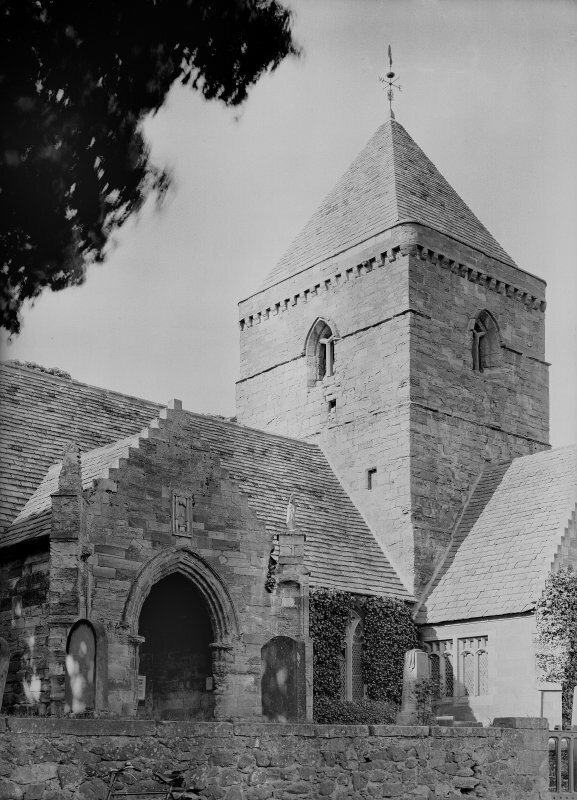 Central tower with small two-light openings, a stair-turret at the NW corner and a low slated spire recessed behind a corbelled parapet. 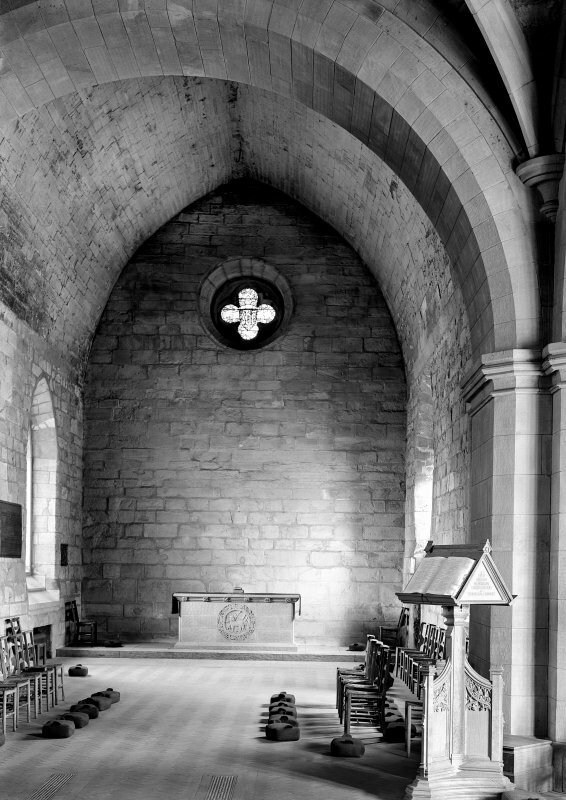 The N wall of the nave opens into a shallow rectangular projection added in 1832 and rewindowed by Lorimer. 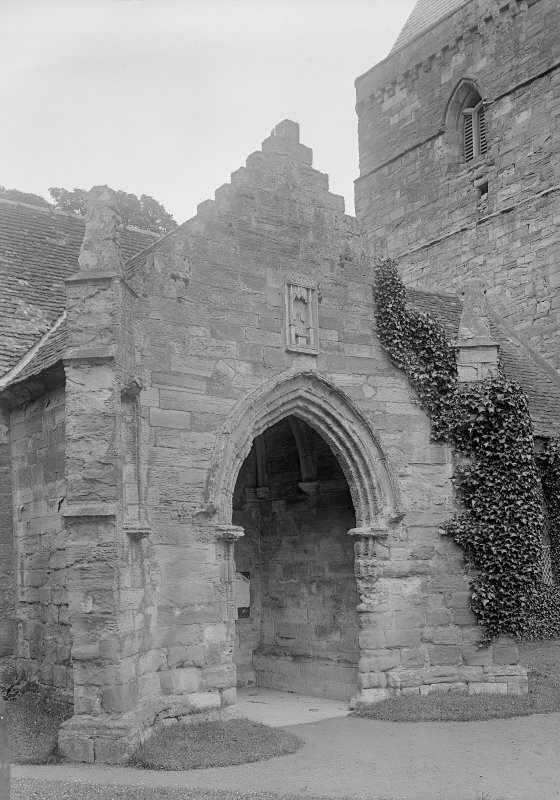 The S porch has a large, roughly detailed arch, a canopied niche over diagonal buttresses and, inside, a tunnel-vault with surface ribs. 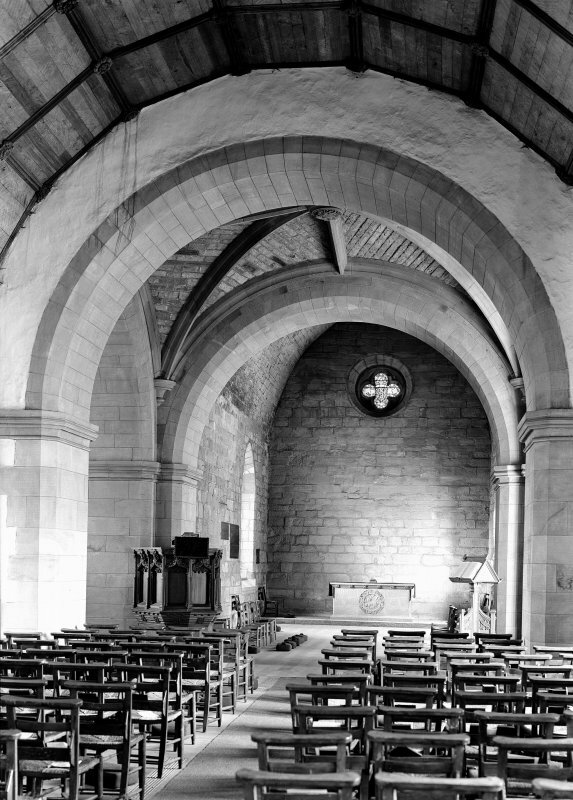 Plain pointed tunnel-vault over the choir. The crossing is entirely Lorimer's but reproduces the old design. 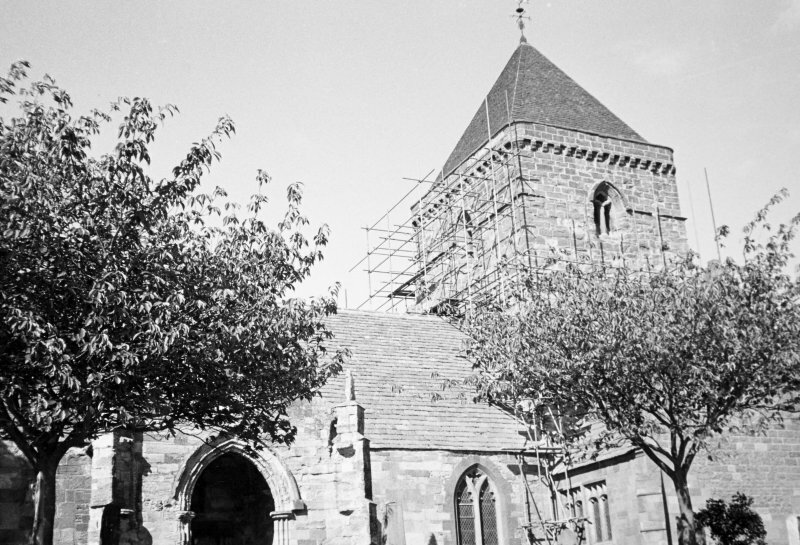 Also by Lorimer the ceiled wagon roof over the nave and transepts. 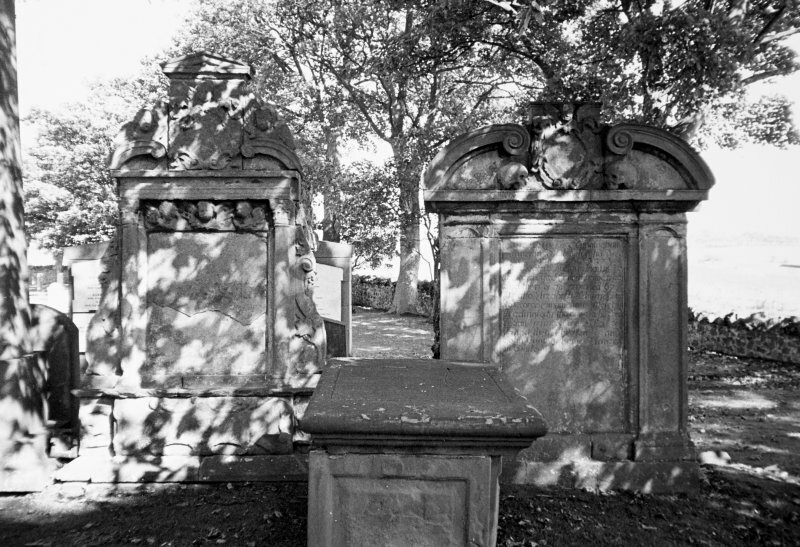 Photographed by the RCAHMS in 1978. Visited by OS (WDJ), [no date cited]. 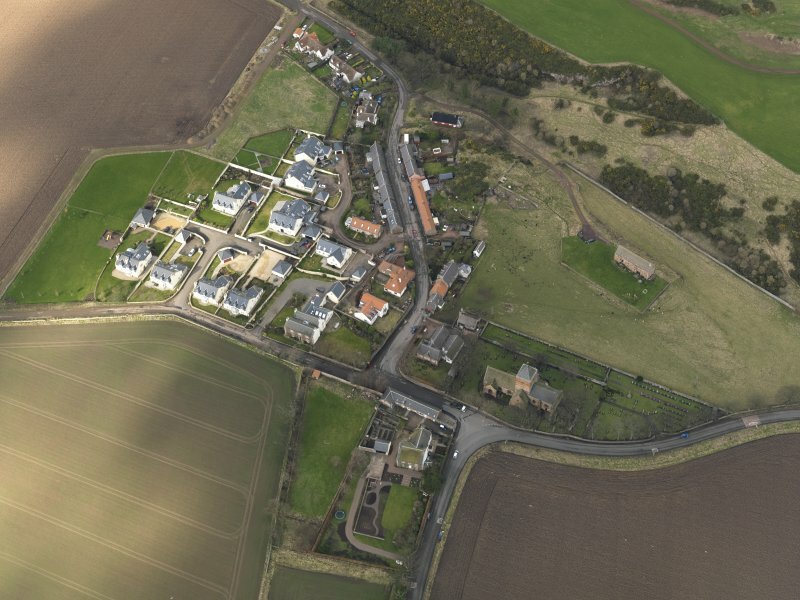 An area ground resistance survey totalling 4, 000 sq. 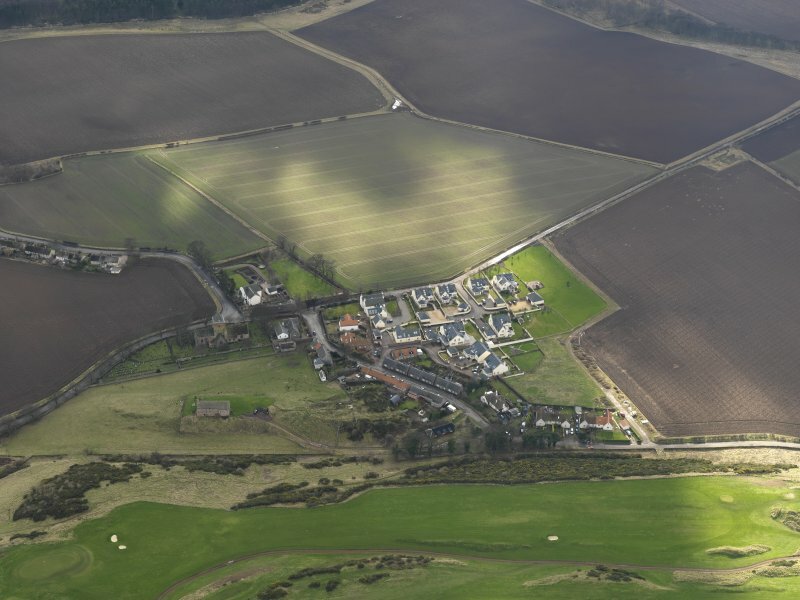 m. was carried out in October 2014 in part of a field to the North of the churchyard of St Mary's Parish Church at Whitekirk, East Lothian in the parish of Whitekirk and Tyninghame. 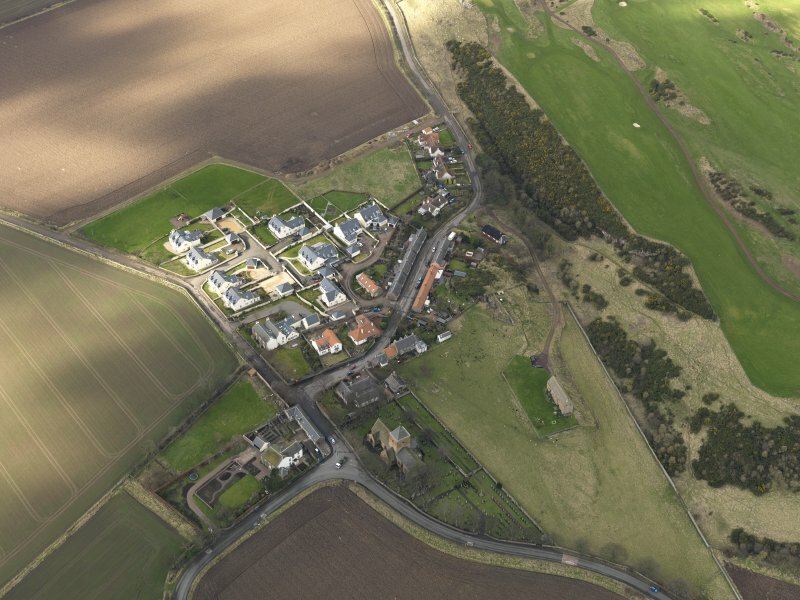 The survey, centred on NT 59602 81568 (NT58SE 12) was arranged by Connolly Heritage Consultancy. 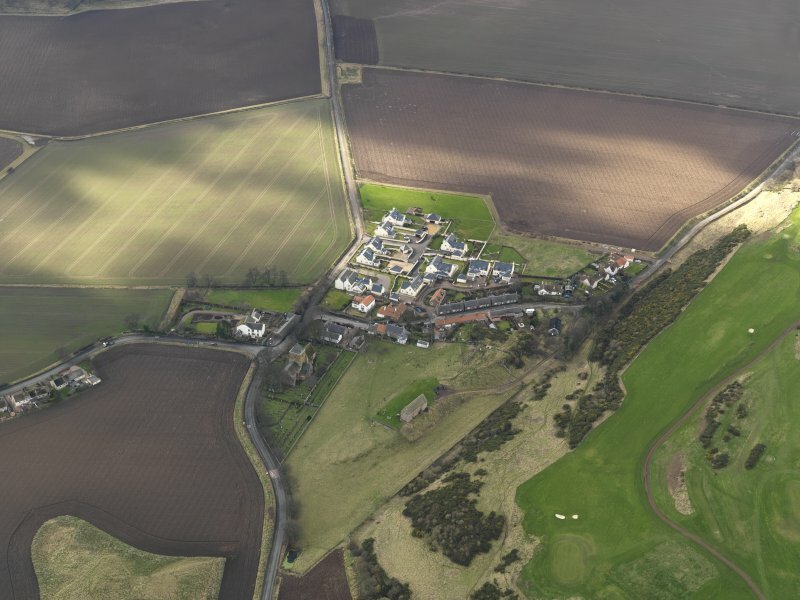 Ten 20x20 grids were surveyed over an area of 100x40 sq.m in a gently sloping pasture. 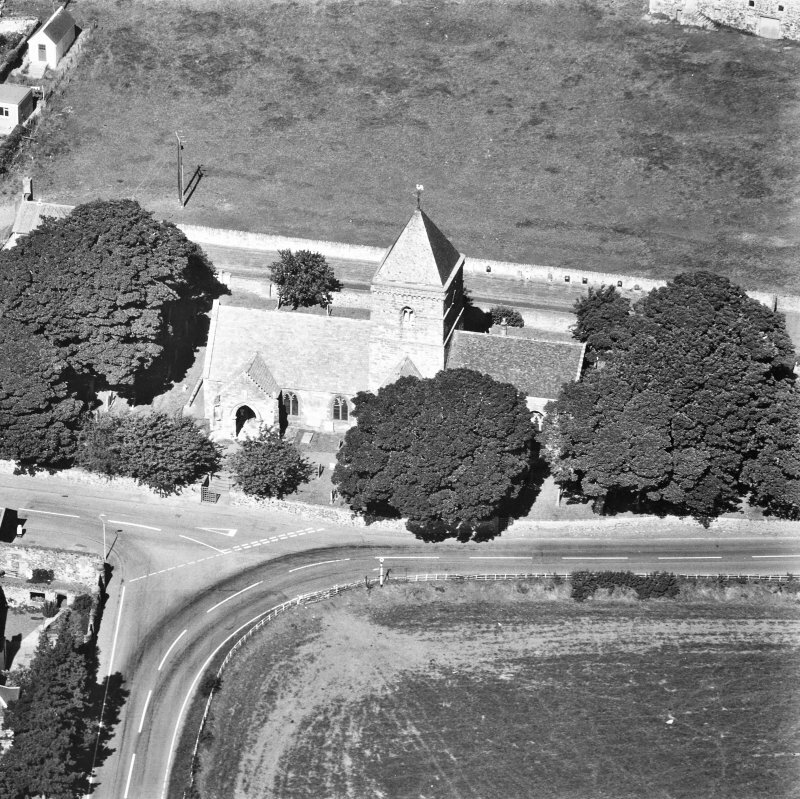 The area was bounded by the wall of the churchyard to the S, by the garden fence of the tithe barn to the N and by field and garden walls to the East and West. 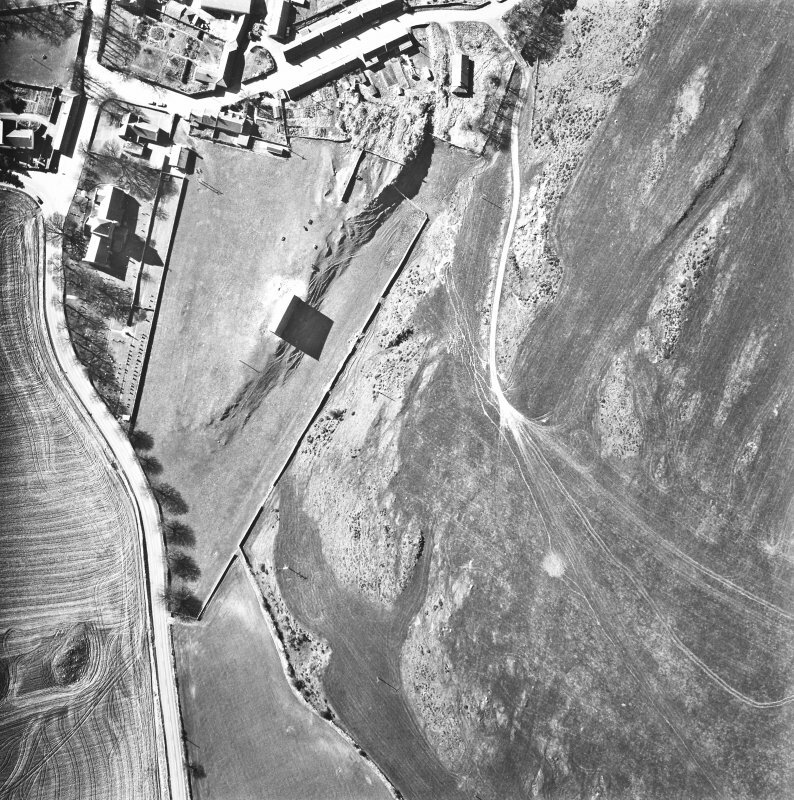 Resistance variations recorded revealed that the site was generally of a low resistance with the exception of three areas of higher resistances at the SE, extending from the NE and at the extreme E of the survey area.